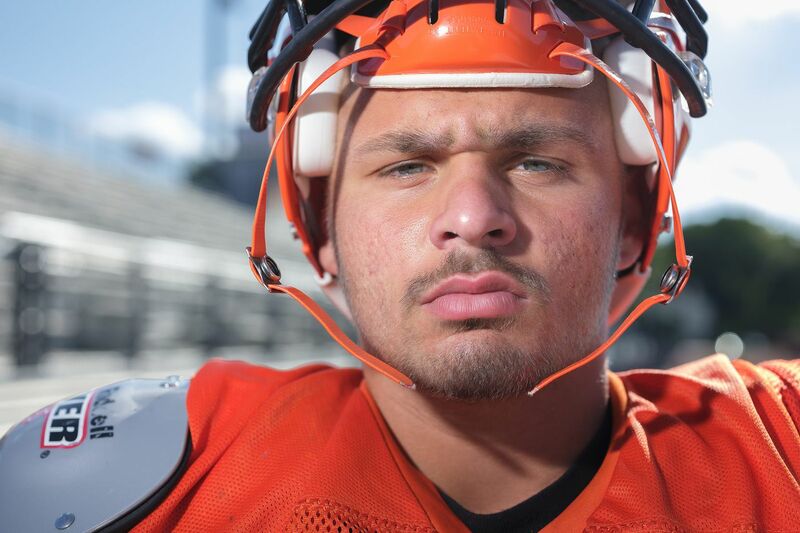 Lineman Sal Tartaglia is playing for Marple Newtown after being diagnosed with Hodgkin's lymphoma in April. The Marple Newtown football program had been down this heart-wrenching road before. Former lineman Mike Shelly, who graduated in 2018, got a diagnos of Stage IV Burkitt lymphoma in 2014, a few weeks before his freshman season. Fortunately, the Newtown Square resident overcame the illness and returned to play two seasons for the Tigers. Cameron Mathes, a former wide receiver and cornerback who graduated in 2017, was diagnosed with leukemia when he was only 1 1/2 years old. In April, offensive guard and defensive tackle Sal Tartaglia said he noticed a "knot on the left side of his neck, and then it started getting bigger and bigger." What Tartaglia had first thought might be only a swollen gland turned out to be much more serious. A visit to his primary care physician and subsequent tests revealed that the 17-year-old had Hodgkin's lymphoma, a cancer that affects the infection-fighting cells of the immune system, called lymphocytes. Naturally, Tartaglia, his parents, Sal and Tracie, and 23-year-old sister, Marissa, were stunned by the news. "I shed a couple of tears at my doctor's office, but I hugged my parents and said, 'Relax, we'll get through this,' " Tartaglia said. Like Tartaglia, former Marple Newtown football players Mike Shelly (left) and Cameron Mathes overcame cancer. Tartaglia was determined from the start not to let the illness impact his senior football season. "It was one of the initial things that came to my mind," he said. "I wanted to be out there for our first game." Following the diagnosis, Tartaglia, of Broomall, went to Children's Hospital of Philadelphia for treatment. There, starting on May 4, he went through four rounds of chemotherapy. Tartaglia made it clear to the doctors at CHOP that, outside of his stays for chemotherapy, he wanted to undergo treatment in an outpatient setting. "I didn't want it to totally take over my life," he said. "I hated each time I had to be in the hospital. It was like being locked up. When I didn't have to be there for chemotherapy, I wanted to be at home, at school, and with my friends." Tartaglia endured four nausea-inducing rounds of chemotherapy. "It was supposed to be six or eight, but I guess my body responded well to the chemo," he said. Tartaglia's last round of chemotherapy was on July 11. The 5-foot-9, 210-pounder was cleared to resume practicing with the Tigers in late July, about a week before the official start of training camp. "He's had a such a positive outlook through this whole process," Marple Newtown head coach Chris Gicking said. "He's very mature for his age." At times during camp, when his teammates were running wind sprints or doing other drills, Tartaglia would instead do push-ups or stretch on the sideline. "We wanted to make sure he didn't overdo it," Gicking said. "He's had a lot of things go on, physically, recently and it's best to be cautious about things whenever possible." Tartaglia, who began 14 days of radiation therapy on Wednesday, was in the starting lineup for Marple Newtown's Aug. 24 opener, a 43-0 nonleague blanking of KIPP DuBois. "It was pretty emotional for me, considering how far I've come over the last four months," he said. "I feel so blessed."